Year 6 Graduation proud to have been part of these young people’s lives. As I look around the room tonight I see a sea of purple. You may be in any colour of the rainbow but because you are part of our Safa family you are, without any doubt, always going to be purple. And it is the same shade of purple that I see, so it does not matter how long you have been part of our family – you are still purple! There are times in all our lives when we face crossroads and have to make a decision. There may be only two choices or there may be many and we will take time to weigh up the pros and cons of each option. We may take the road which most of our friends will take so we will not be alone on the journey. Sometimes we are either persuaded by other people or by what appear to be better options to take a different road, perhaps not your first, second or even third choice. There are times where the decision on which road is made for you without you being part of the choice. You have all been faced with decisions like this this year and will face many more such decisions as you journey through life. Keeping all this in mind, I think it is not just the choice of road that will make the difference in the long run; rather it is the way we choose to travel and it is choose as we can make a conscious decision on this. You could choose to battle your way along the road butting heads with those you meet which will, in the long run, make the journey very difficult and draining. You will miss opportunities that come your way with your resistance. You will miss out on the friendships and people who would help guide us. This may be the right road for you but you will not benefit from it as you should or could if you had chosen a different way to travel. You could choose to question your way along the road looking for justification, validation and reassurance while being suspicious of those around you. Why am I here? Where are we going? Is this the right road? I think the other roads are better! Criticising the choice and the options available perhaps out of a lack of self belief that you cannot get to the end and the fear of failure is looming. This will make your journey hard for both you and those who are also on the same road. You will miss out on the exhilarations of the new experiences along the way which will shape you as a person. You could choose to set out with an open mind considering every opportunity and friendship along the way. You could welcome the challenges which face you bravely and with a ‘can do’ attitude knowing that you will have help and support around you. You may find yourself battling or questioning which is no bad thing but you will be doing so with an open minded perspective. You will share the experiences with those who are like minded and are on the same pathway establishing friendships for life. So, to sum up…make a conscious choice on how you travel each journey in life. There will be changes: look on every change as an opportunity, you never know what is round the corner. View every closed door as a new beginning, open everyone: you never know what is behind it – yes it might be a surprise (booh!) or challenge but it might lead to new and better things. You will always take a piece of Safa with you! This entry was posted in Uncategorized on June 23, 2014 by janemgardner. Fantastic speech! Best of luck on your gap year. 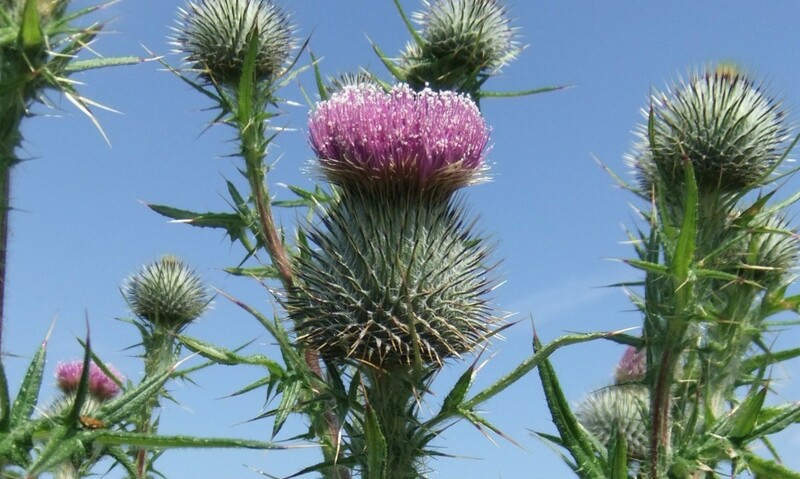 Love the thistles photo x. The MacDonalds.